More Qasim Rashid inspired nonsense. Sorry I’m late. Is there a word missing in the third panel? Author – missing “treat” in the third panel. Can delete this comment after. Excellent. Author, box three looks like it is missing a word (probably “treat”). Missing ‘treat’ between ‘should’ and ‘all’ — or maybe it’s ‘beat’? Clearly some great minds here! Thanks to all who pointed out the missing word! Fixed now. Thanks Author. Another great skewering of religious “morality”. I’m wondering if there is some mileage in presentation of Harvey W as a great modern Muslim… after all he seems to have treated all his women – and slaves – with great “equality”. I reported the Naked Rambler petition to NFN (the Dutch Nudist Federation), requesting they give it publicity. May take some time though. If and when they do, I will report back. Author, this one is your best yet. Simply perfect. I’ve read that Islam has very progressive attitudes toward women, but this really clears that up for me. Dr John, that’s the spirit. A few organizations behind this petition and we might accomplish something. I just realized that I haven’t yet put it up on my website where my dozens of followers could get on board with it. BTW. Bill Nye had a tour of the Arc Encounter theme park led personally by Ken Ham, who informed Bill that we wear clothing “because of sin”. Really? That’s the fundie reason? I saw your petition and thought it was an interesting counterpoint to the current debate in Quebec regarding a ban on face coverings. I’ve tried to share it on the Globe and Mail comments section. It was kicked back once but I’ll try again and see if it goes by the community censors. I’m curious to see if you receive more signatures and would be happy to see updates on the progress. Who has altered this comic??! Satan has inserted the word ‘Treat’ in to panel 3. Anyone who claimed it made no sense in its purest, inerrant form is a blasphemer and must be put to death! Who is with me…? Islam is very thoughtful where women are concerned. Just think, the country ruled by the Keeper of the Holy Places waited for over one hundred years before deciding that it was safe for women to drive cars. He was not about to risk their ovaries by being too hasty. Women in Saudi Arabia recently acquired the right to drive. Maybe in a few more decades, they’ll be able to OWN property instead of BEING property. Sure wish I could share your optimism! Stupidity is synonymous with imam. JoJo, I’ll have to take a pass on the smiting. Not that I’m an anti-smitite, it’s just that one of the accused is, like yourself, a valued member of our merry band of miscreants, a C&B regular of long-standing (I suspect haemorrhoids) and previous good character (despite being Scottish). Any chance you could follow Trump’s excellent example by pardoning one of our own? I must be incredibly progressive, because I treat all my wives equally. OK, I only have one wife, but I respect the reflexive property of equality and my treatment of her is precisely equal to my treatment of her. Yep, women have the right to drive a car. They are just missing the right to go on the streets without the approval of their hubbies…. Or in short: what value has a right to drive if you don’t have the right to leave your home…. Looks like Islam and Mormons have more in common than previously thought. A sentence I never would have previously thought to utter. AoS – thanks for leaping to my defence (the cream is working BTW). I am, in fact, already smitten, by someone much more attractive than JoJo (no offence intended, JoJo. Please don’t accuse me of hate speech). I dunno, it didn’t feel uncivil when I wrote it. Maybe it’s just me. I tried it a second time with the same result (sometimes this works on the site). they didn’t like that either. But now I’m feeling a bit put out (ok … pissed off) so I feel I have a mission to accomplish. If I should be successful in publishing a comment I’ll update you. If not I”ll explore other options. Sorry for the spelling mistake in the last comment. I meant “your” instead of “you’re”. Oh now you’ve gone and done it author. As any fule know, all of the bad stuff about Islam (e.g. killing gays, treating women as property, treating young men as living bombs) was all the fault of colonialism. Or was it the patriarchy? No, I think it was colonialism this time. Something other than the freely and clearly stated beliefs of the adherents anyway. Some Dude, no worries. You dodged the POTWA there. We usually don’t react to obvious typos and you got it right in the previous phrase. My typing tends to follow my audio cues, so I often find that I have typed “hear” when I mean “here”. Vigilance is required. Speaking of reacting to typos, I may have created my first viral joke. But I had a spelling Nazi miss the pun “dis pair of boots” and complain that the spelling mistake was annoying. Too funny. DH – I tried the link, and Kasperski wouldn’t let me open it, stating “The object is infected by HEUR:Trojan.Script.Generic”. Perhaps worth checking, though it could, of course, be Kasperski being silly (it wouldn’t be the first time). HaggisforBrains, Kasperski may well be on to something. I have no problem going to my site, but when I try to log in I often get one of those phony scare warnings that takes over my computer and won’t let me quit, telling me my computer is infected and don’t shut it off or you’ll lose your hard drive. Instead, call this number to talk to Microsoft so we can take over your machine and extort some money from you. The real Microsoft says this is just scammer trying to gain access to my computer. Whenever this happens, I reboot and all is well again. I’ve discovered that I can safely log in to my site provided I don’t try to do it from my homepage. I need to go to the link for logging in directly. So, unfortunately, Mr. Kasperski may be correct and I’ve caught a cold on that site. I haven’t tried to treat it because it’s a long and complicated process and I’m not sure I trust the information about how to clean it out. Can’t trust anybody on the Internet these days, eh. So here’s my joke: I had some bricks piled up in my porch. I put a pair of rubber boots on them, and that reminded me of Ozymandias. So I stuck a sign on the bricks saying : My Name is Ozymandias King of Kings. Look upon my works ye mighty and dispair. This joke works on several levels for those who know my situation here. We’ve dug a full basement under our house and landscaped the whole yard. It’s all pretty impressive, but of course it won’t last past my departure, when the place will probably be turned into a commercial development or a parking lot. Also, the spelling of despair is not a typo. Look upon my works all ye mighty and dis pair of boots. I’ve had at least one spelling Nazi miss the pun and complain about the spelling. Thanks for letting me know about the Kasperski warning. Now I may have to take action. Thanks for the joke, DH, and good luck with disinfecting your site, which still gives me the warning message. I think the important part of a claim that “islam was way ahead of its time” is “its time”; it doesn’t mean that it isn’t incredibly regressive nowadays. NOTE: This comments section is provided as a friendly place for readers of J&M to talk, to exchange jokes and ideas, to engage in profound philosophical discussion, and to ridicule the sincerely held beliefs of millions. As such, comments of a racist, sexist or homophobic nature will not be tolerated. If you are posting for the first time, or you change your username and/or email, your comment will be held in moderation until approval. When your first comment is approved, subsequent comments will be published automatically. 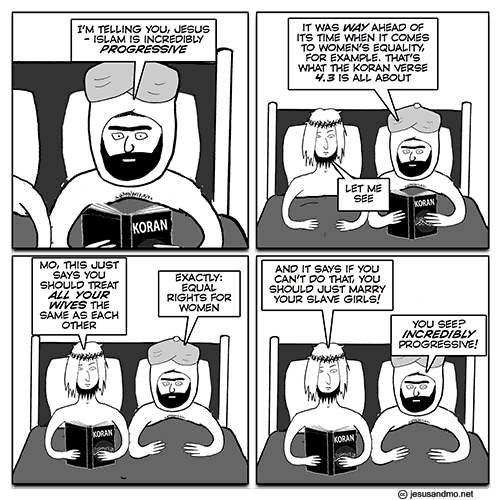 Jesus & Mo (the characters) are absurd, blinkered, and oddly very sweet. J&M (the cartoon) is brilliant: sharp, delicious, irresistible. Jesus and Mo cartoons are wonderfully funny and true. Jesus and Mo make the world a better place, bless their little hearts. 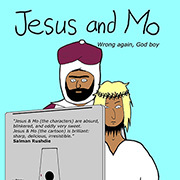 In a world defined by outrage and offence and liberal spinelessness, Jesus and Mo is a treasure, whose value we should never fail to recognize. Read them. Laugh. And think. ...rays of sanity in a befuddled world. 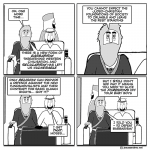 J & Mo is the funniest and most consistently thought-provoking cartoon strip on the Net. In a saner world, it would run in a major newspaper. Consistently amusing, frequently thought-provoking and often heart-warming. Jesus & Mo is one of the most wonderful things on the internet..
Wittily captures much of the absurdity of religious apologetics. The Eric and Ernie of monotheism. The most impious double act since Sodom and Gomorrah. I love jesusandmo.net cartoons - witty and sharp! Often hilarious, frequently wry, these cartoons do what all the best cartoons do: they tell the truth through humour. Wrong again, God boy - the 7th volume of J&M strips, with a foreword by Ophelia Benson. NICE T-SHIRT (Thank you for not provoking my uncontrollable lust). Others available. Click the pic to see.